Life on The Scrap Heap: Time Out - 10 Minute Fail! Time Out - 10 Minute Fail! Time Out's latest challenge is an absolute nightmare for a creative procrastinater like myself: Autumn with the optional twist of Speed Stamping. Of course, what I planned and what I produced are two totally different things. 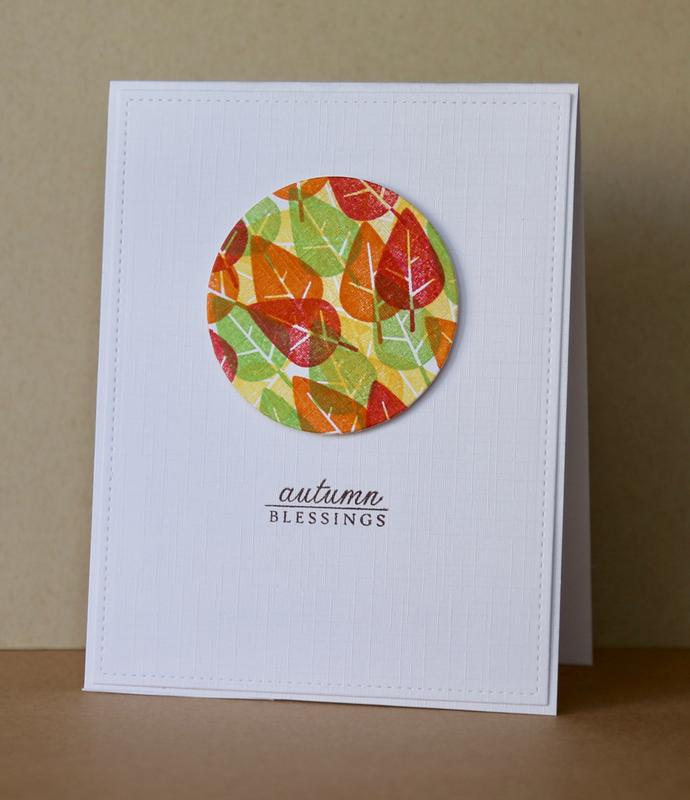 I made a circle mask and envisioned a crisp, stamped circle of WMS Autumnal leaves with a PTI sentiment perfectly placed underneath. Unfortunately the stamping left a blurry edge as the ink didn't adhere to the textured card stock too well. In panic I reached for the brown marker to create some faux stitching around the edge. It looked like something a 5 year old had made. So I rooted through my stash for a smaller circle, cut it out and plonked it on to the card case. In total it took me 14 minutes and 12 seconds. Considering I had to make the mask, die cut the panel, create the base, do the stamping and look for stuff inbetween I don't think I've done that bad a job! What do you think? What a simple, gorgeous card you ended up making Claire! I love the story. This is CAS perfection and looks quite elegant. Awesome job despite the re-routing! Great to see you at Time Out! Thanks for playing with us! I love hearing how your card came about! Your end result is absolutely amazing! I love the gorgeous pops of color surrounded by my CAS loving while space!! Papertrey Ink Stamp A Faire - Inspired by Muse!